It’s that time of the year again - the biggest celebration in the country for everyone of ethnic Chinese descent. You guessed right – it’s the Chinese New Year! What better way to celebrate the New Year than with loads of new clothing from Zalora? New Year Fashion for the whole family! One of the most important New Year traditions for the Chinese is dressing up in new clothing. Discarding the old and wearing new clothes signifies starting the New Year on a clean slate. New Year clothing are usually bright red as it is believed that the colour, being the colour of good luck and happiness, scares off evil spirits and bad fortune. Usher in the brand new year by indulging in the wide array of amazing fashion at Zalora! 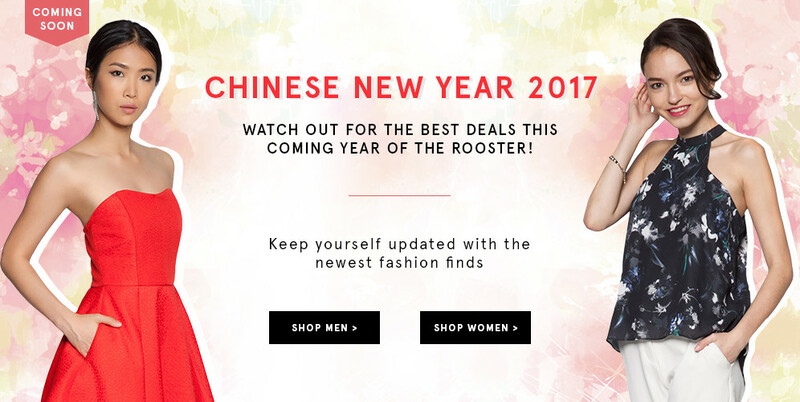 Check out the amazing Chinese New Year offerings on our site that features an extensive selection of items, including men’s apparel, women’s clothing and accessories! Kung Hei Fat Choi from Zalora Philippines! Browse the collection now at Zalora Philippines and start filling your cart! You get a free voucher upon signing up on our site. Payments via Paypal, bank transfers, credit/ debit card as well as cash on delivery are accepted. With our excellent return-policy shopping online has never been easier. We believe in creating a stress-free and pleasant shopping experience for our patrons. Zalora Philippines wishes all our ethnic Chinese patrons, Kung Hei Fat Choi!